Live Path Effects, or LPEs for short, is a system for applying some kind of effect to a path. Inkscape stores the original path data in the Inkscape Name Space so that it can be modified at a later time (it will not be displayed by other SVG renderers). If the original path is modified, the LPE will be regenerated. The resulting path is stored as a normal SVG path. Inkscape includes a handful of LPEs. With a solid framework in place, it is planned to migrate most of the path effects found under the Extensions menu to LPEs. This has two advantages: The effects will be faster to render and the original path is stored for future editing. LPEs also work with Groups of paths. Regular Shapes are converted to paths automatically. To use an LPE, select a path (the skeleton path), call up the Path Effect Editor dialog (Path → Path Effect Editor... (Shift+Ctrl+7)), select the desired effect from the drop-down menu in the dialog, and then click the Add button. Multiple effects can be chained (stacked) together. The order in which each effect is applied can be changed using the arrow icons. Each effect can be temporarily “turned off” by clicking on the icon next to the effect name. This is handy if you want to edit the skeleton path (or a Group of skeleton paths). 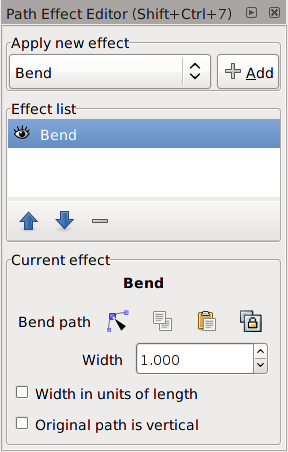 Path Effect Editor dialog with a path selected. When an object is selected that was generated by an LPE and the Node Tool is enabled, the original skeleton path nodes are displayed. In addition the path itself may be displayed in red. Visibility of the path is controlled by the icon located in the Node Tool-Tool Controls. This path can be edited like any other path. Several of the effects require one or more additional control paths. In this case, the needed paths are automatically generated (straight green lines). To see these paths, either click on the node editing icon ( ) in the dialog or press 7 while the object is selected and the Node Tool is active. A control path is fully editable like any other path. The path can be replaced by another through pasting from the clipboard using the paste icon ( ) in the dialog. You may need to translate the control path (select all nodes then drag with the Node Tool). The path can also be copied to the clipboard by using the copy icon ( ) in the dialog. An existing path can be used as a control path through linking. To create a link, first copy the path (Edit → Copy (Ctrl+C)) to the clipboard and then click the link icon ( ). Note that the linked path must be copied and not cut. Linking can be used with Shapes and Text without converting them to paths first. LPEs are normally applied recursively to all objects in a Group. The Bend and Deformation LPEs, however, are applied to the whole Group once. An LPE can be converted to a regular path(s) by using the Path → Object to Path (Shift+Ctrl+C) command. An LPE can be removed using the Path → Remove Path Effect command. An LPE can be copied from one object to another using the Path → Paste Path Effect (Ctrl+7) command. To do so, first copy the object with the LPE you wish to paste using the Edit → Copy (Ctrl+C) command. The implementation of LPEs has many bugs, especially if removing effects from a path or chaining LPEs. Paths can be left with LPE cruft in their attributes and without a valid SVG path. You can always check objects with the XML Editor dialog. It may be useful to vacuum the file (File → Vacuum Defs) to remove unused LPE definitions. Save work often!